The Air Force will decide this fall whether to build more GPS III satellites or move to a new generation of spacecraft, the leader of Air Force Space Command told Congress last week. “We’re on contract right now . . . through (GPS III) satellite vehicle number eight. 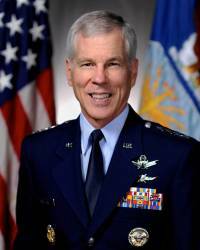 Satellite vehicles nine and beyond – the acquisition strategy for that – will be debated in the fall,” General William Shelton, commander of Air Force Space Command (AFSPC), told the House Armed Services Committee on April 25. The issue is cost. The price of the spacecraft — and of getting them into orbit — has escalated to the point that the program no longer appears affordable, sources familiar with the issue told Inside GNSS. One source said that a decision has already been made to stretch out the launches of the GPS III satellites — to the point that there are no launches planned for 2017. Shelton, however, told the committee that “we fully expect that [GPS III] will stay within the cost bounds we established in 2008” when the contract was let. To address the cost issue, the Air Force is looking at a wide range of ideas and is upping the competitive pressure. On January 29, the Pentagon released a Sources Sought Notice for GPS III satellites 9 through 20 — a contracting step that gives potential bidders a chance to float proposals and the Air Force an opportunity to check out new concepts. According to the notice, the Air Force expects to release a full solicitation in fiscal year 2014 to purchase 12 GPS III Follow-On Production Space Vehicles. The Air Force may purchase another 12 spacecraft after that for a total of 32 GPS III satellites. Sources told Inside GNSS that at least two companies are now in meetings with the Air Force regarding the contract. Though no one would name the potential bidders, the two most likely competitors are Lockheed Martin, which developed and is building the first eight GPS III spacecraft, and Boeing, which is wrapping up its contract for the GPS IIF space vehicles now being launched. The firms are angling to build a block of satellites with what the Air Force describes as “minor capability changes.” Among these are industry-initiated “cost saving measures,” including “new materials and new technology,” Gil Klinger, deputy assistant secretary of defense, Space and Intelligence Office, told the committee in his statement. One of the key requirements will be a shift to dual-launch capability. Long discussed, this plan to place two satellites in orbit at a time is funded in the president’s FY2014 budget request and a requirement in the solicitation. The new satellites would use SV08, the last of the current block of GPS III satellites as the technical baseline. The new design would then have to accommodate a redesigned Nuclear Detonation Detection System payload, civilian rideshare payloads, and a Laser Retroreflector Array (LRA)). Other add-ons include dual-band transponders (Unified S-Band) and Li-Ion batteries, the requirements state. One of the most important changes would be a digital waveform generator which would enable GPS program mangers to add new navigation signals. This would make it possible to change the signals transmitted by the constellation without having to launch new satellites. Not everyone is convinced, however, that making changes at this point is a good idea. “Would it be better to continue (GPS III) as opposed to starting a whole new fourth generation?” asked Rep Doug Lamborn, R-Colo.
Lockheed Martin, which has been awarded the contracts to build the first four satellites and buy the long-lead items for space vehicles 5-8, is the company to beat. The firm announced April 10 that it had completed work on a Delta Preliminary Design Review (dPDR) for SV09, which included the LRA and the new waveform generator. That would appear to give Lockheed Martin a clear advantage. Indeed, the Air Force made clear in the solicitation that it is inclined to stick with the current GPS III prime contractor. A decision is expected by August or September. After that the winner will be on a fast track. According to White House budget documents, the preliminary design review for the next block is planned for the fourth quarter of fiscal year 2014.